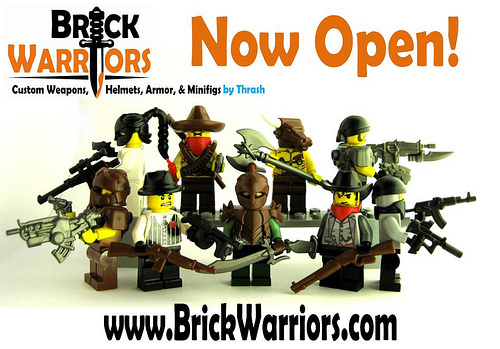 BrickWarriors is a new company, specializing in custom weapons and accessories designed for use with LEGO minifigures. They recently sent me a complimentary review package of their initial offering. The quality of the pieces is on par with the other well-known custom companies. While the plastic doesn’t feel exactly like LEGO, it is very close and the pieces are sturdy. None of them feel flimsy or brittle. At the time of this writing, there are only four colors: Black, Red, Brown, and Dark Pearl Gray. 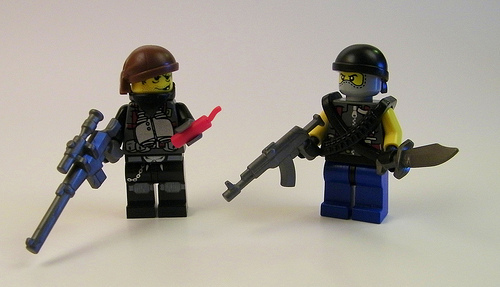 The color matching for the black and red pieces were identical to the official LEGO pieces to which I compared them. The brown pieces were very close to official pieces and the dark pearl gray was just barely lighter in color than the pieces I checked it against. The fit and compatibility was good. None of the items appeared to stress the hands of the minifigs. The weapons have multiple grips points in the places you would expect the real guns to have them. The hats, helmets and armor all fit well. They were not loose or too tight. There was one item with some fit issues. Before sending me the items, the designer informed me that the horn attachment points on the Minotaur head had issues. Brickwarriors uses the official LEGO horns for the Minotaur and apparently LEGO made the horns slightly larger than the standard bar connection. The Minotaur holes are sized for the standard bar, therefore the horns stress the hole a bit. I checked this out and the official horns fit very tightly (I had some trouble getting them out) but other bar pieces fit just fine. BrickWarriors informed me that they are currently working on their own horns, which will be sized correctly. 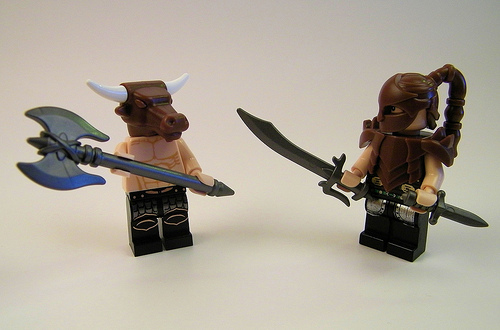 Also the neck hole on the Minotaur is tighter than on official Lego heads, but it does come off easily. 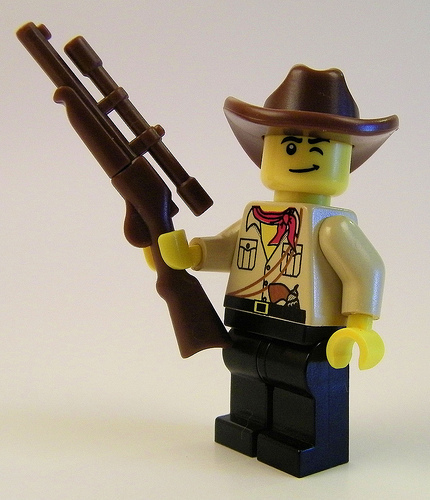 The company has made an effort to maintain the look of official LEGO pieces. Mostly this works for them pretty well. One place that I don’t think it works very well is in regards to the solid trigger guards on the guns. The company told me that they chose this design because they thought that it maintained the look they were trying to achieve. The price of the items is reasonable, with US$1.00 being the price for most of the weapons and smaller accessories. The larger guns are priced at US$1.25. The armor, other bodywear, and helmets are US$1.50. The most expensive item is the Minotaur head at US$2.50. The weapons and accessories cover quite a range of genres, from Sci-fi and Fantasy to Historical and Modern items. As a dyed-in-the-wool Castle fan, I’m partial to the Fantasy Items, but Space, modern warfare and apoc fans will enjoy the modern and futuristic armor and weapons. Overall, I thought this was very good first run of items and hope to see more from this company in the future. 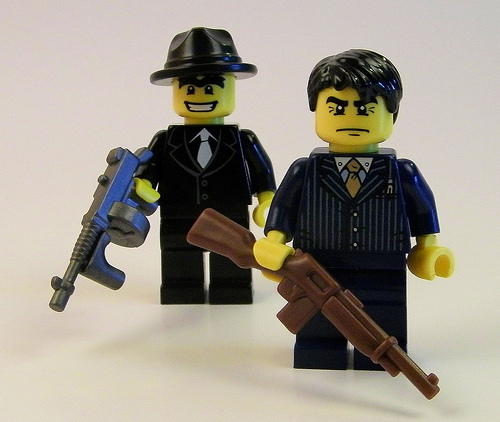 They have a number of unique items that help them stand out and will fit nicely into any collection of custom minifig accessories. If you wish to see more, you can view all the pictures of the items in my BrickWarriors Review Pictures Set. I hope that they ship to Australia soon.